BEIRUT (CNS) — While the flow of migrants into Europe and the West has sparked controversy, Lebanon continues to bear the brunt of absorbing massive numbers of refugees. A commonly cited figure is that one in four people in Lebanon is displaced from Syria. 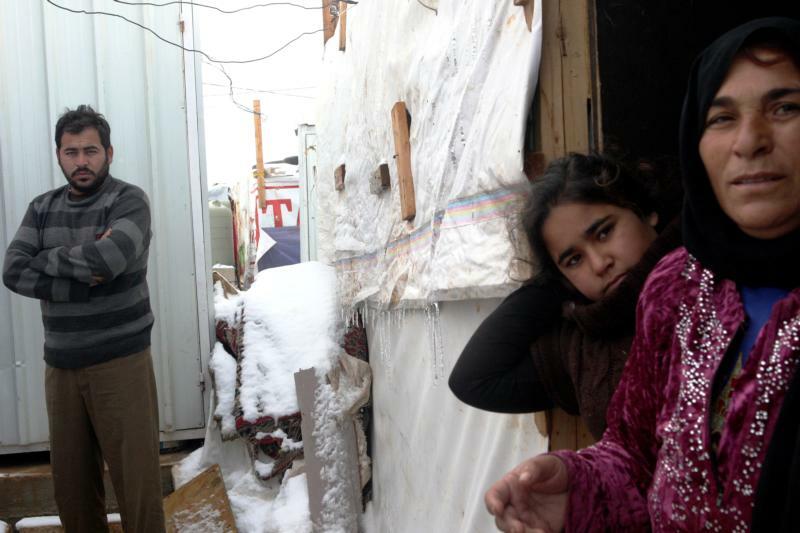 “They are everywhere … in all of Lebanon,” Father Paul Karam, president of Caritas Lebanon, told Catholic News Service of the presence of Syrian refugees in the country, which is roughly two-thirds the size of the state of Connecticut. There are no formal refugee camps in Lebanon. Rather, some Syrians establish — with the permission of the local municipality — informal tent settlements. Others find ways to rent space in apartments or squat in abandoned buildings. As of November, the U.N. High Commissioner for Refugees calculated there were nearly 1.1 million registered refugees living in Lebanon — but not all refugees are registered with the U.N. agency. The true scale of the influx is that there are more than 1.5 million Syrian refugees in Lebanon, equal to almost one-third of the country’s existing Lebanese population of nearly 4 million, Father Karam said. In addition, there are 20,000 Iraqi refugees. Although Jordan and Turkey are also hosting Syrian refugees, Father Karam noted Jordan is almost eight times the size of Lebanon, and Turkey about 24 times larger. According to a UNHCR report released Dec. 18, Lebanon hosts more refugees compared to its population size than any other country. “The Lebanese have shown a real spirit of welcoming the refugees. They help them, they are assisting them, but of course this cannot continue for too many years,” he told CNS. Most of the Iraqi refugees are Christian, and about 97 percent of the Syrian refugees are Muslim, Father Karam said. Consequently, the overwhelming presence of Syrian refugees upsets the demographic balance of Lebanon, which is about 40 percent Christian. “It will destabilize the system,” Father Karam warned. Lebanon’s demography is based on 18 religious confessions, 12 of which are Christian. At least 65,000 Syrian babies born in Lebanon since the outbreak of the Syrian conflict are stateless, with no identification documents. Their births are not registered in Lebanon or in Syria. “So, shall Lebanon have another story with the new, let me say, scenario, with Syria?” Father Karam asked. He cited the presence of Palestinians in Lebanon for more than 60 years “and nobody has resolved their problem.” Currently, there are about 500,000 Palestinians in Lebanon, most in areas agreed upon between Palestinians and the Lebanese state; these areas are commonly referred to as camps. On a practical level, Lebanon’s infrastructure cannot cope with such a huge number of refugees. Even before waves of Syrian refugees began descending upon the country more than four years ago, Lebanon had grappled with shortages in water and electricity. Michel Constantin, regional director for Lebanon, Syria and Egypt for the Catholic Near East Welfare Association, an agency of the Holy See, shared similar thoughts. “Lebanon cannot bear this responsibility without the support of the international community,” Constantin said. “As the crisis persists, refugees are exhausting their savings and resources, becoming more vulnerable, and are increasingly at risk of resorting to negative coping mechanisms,” Constantin said. In Lebanon and beyond, millions of refugees remain in need of lifesaving humanitarian assistance, he added. The Lebanese government does not allow refugees to work. To get by, some refugees work informally, for low wages and often in subpar conditions. But if the Lebanese government learns that refugees are working illegally, they will lose their UNHCR card and residency papers, said Davide Bernocchi, country representative for Catholic Relief Services in Lebanon. CRS, the U.S. bishops’ international relief and development agency, is a member of the worldwide Caritas network. “This situation places refugees in a perpetual cycle of dependency, not feeling as though they can move forward,” Bernocchi said. “A recent positive move, however, was the announcement by the Lebanese Ministry of Education to make space for 200,000 school-age children in the public schools for the current school year,” Bernocchi said. Yet Lebanon’s own population is being squeezed economically. “The Lebanese have also slipped slowly to poverty under the pressure of competition represented by the increasing supply in the labor market and the increasing demand on goods and services,” said Constantin.